Every office needs things freshening up now and again. It may be the decor needs to change to brighten the place up, or something structural like the way teams are organised. On other occasions, it can be beneficial just to move people into different teams based around new desks. However, such moves can have pros and cons, which are important to bear in mind. The following considerations should be taken into account when dealing with what can sometimes be tricky rearrangements. Your office is full of adults who should, in theory, make the effort necessary to get along with their colleagues, even if they are not with people they might choose to be friends with. After all, this is a professional environment, not a school classroom. However, the reality is that, with the best will in the world, there are some people who are like oil and water and they just won’t get on together. Often, this may be the result of a work-related disagreement that has festered. It may be one thing to work with someone you don’t necessarily like, but harder to do so with someone you do not trust. This is often a very good reason to split up those who do not work well together, which may be beneficial for both of them, and thus the company. Equally, however, be careful that when rearranging the desks you don’t end up bringing back together people who have bad history in the past. A wise way to deal with this issue is to allow scope for anyone with objections to a draft desk plan to speak in private and raise any issues this may bring. Then you can adjust the plan if necessary. In some cases, teams are rearranged because the functions of the business work better if certain people are grouped together. 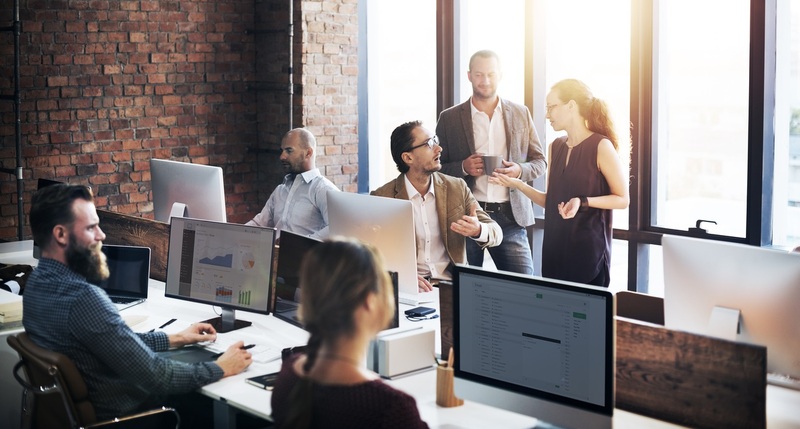 For instance, if your day-to-day work is supplemented by an increased emphasis on one-off projects, it may work to bring together a dedicated project team. This can be highly beneficial in increasing the focus on areas of growing importance for the business. Equally, it may be very unwise to cluster together people whose roles are very different. While there is much to be said for getting people out of “silos” and understanding the work of others, it can leave people feeling isolated if they are having problems with a task and find they are surrounded by people who have no idea of how to help. When implementing desk moves, it is also worth considering the location of the desks in the floor plan, particularly if some people have particular needs. For example, a wheelchair user may need to be located at a desk they can easily access, so placing them in a tight corner by a wall is obviously not a wise move. Equally, people who suffer from seasonally affective disorder should be sat nearest sources of natural light, especially in winter. Consideration should also be given to cases where individuals have particular responsibilities. For example, your fire steward should be able to get away from his desk swiftly to instigate an evacuation in the event of an emergency. So, while changing teams and altering the desk plan can indeed freshen things up, it is important to avoid doing so randomly without thinking through the potential consequences, or listening to those who may have concerns.